The Baltezores keep a low profile. Actually, they’ve done a lot. Cindy and John Baltezore briefly met at one of the Sunday afternoon ropings Cindy’s dad organized at the ranch, but it wasn’t till their days at South Dakota State University that they began dating. They were both involved with the rodeo club and the Little International Ag Exposition during their years in Brookings. At SDSU, Cindy dedicated much of her time to her studies. She ran barrels and served as the girls rodeo team captain. John, a bull rider, tie-down roper and steer wrestler, served as the president of the National Inter-Collegiate Rodeo Association president in 1971. They married while still in college. John had worked for Jim and Julie Sutton and their rodeo company before coming to SDSU; he credits them for encouraging him to finish his college studies. John graduated from college in 1971 and Cindy a year later. Horses were their main focus. They moved to Beresford, Cindy’s home town, and “we set up our own deal,” she said. Their “deal” was Lincoln stables, a training and breeding facility. For a time, John trained horses for a host of clients and his handiness with a rope helped him make AQHA champion roping horses. They took stallions to horse shows, got their required roping points, showed at the World Show, all the things that go into making a quarter horse operation successful. They made several AQHA champions, qualified and competed at many World Shows, and had a World Champion appaloosa calf roping horse. All the while, they had two daughters, Aimee and Heidi. Cindy was busy putting on a kids camp for barrels and poles each summer. She also got a colt ready each year to enter the futurity in Ft. Smith, Ark. And she was pro rodeoing, too, barrel racing across the Badlands Circuit. In the 1990s, as John and Cindy continued to ride, train, rope and futurity theirs and customer’s horses, they started their own breeding program in 1991 with a roan stallion, Fixin To Win. Fixin to Win, their first stallion, was the backbone of the program. He was adept at both the roping and the barrel racing events, and had his register of merit in several different events. “He was a favorite,” Cindy said. A few years later, John and Jim Loiseau partnered on the beautiful palomino colt PC Frenchmans Mark. His offspring have been fabulous in the arena. John roped on Frenchmans Mark, and another of his colts went to Italy, where he was a barrel racing champion for Paul Humphrey. Another Frenchmans Mark carried the 2018 Indian National Finals Rodeo barrel racer to the winner’s circle, and countless other Frenchmans Mark offspring are steer wrestling, roping, and barrel racing in arenas across the area. They include French Flash Charm, Frenchmans Drifty Go, Mark Me Happy, Frosted Sunman, Frenchmans Tanman, KC Frenchmans Jack, KC Frenchmans Baby, I Saws A Mark, French Marked Deck, NZ Frenchmans Kirk, Marks Classic Note, Frenchmans Daizee, Snippys French Mark, Jus Gettin It Done, Osages Destiny, Sheza Frenchman, SL Frenchmans Bar, Royal Fast Frenchman, Dakota War Dance, Le Hemme Win, Flash That French, Frenchmans Gold Charm, MLS Shaken Things Up, Chant N French, and TRM Heza Frenchman. Through this time, the girls were busy in 4-H and S.D. High School Rodeo. Cindy made sure they got to compete, and the girls started “stealing” their mom’s horses. 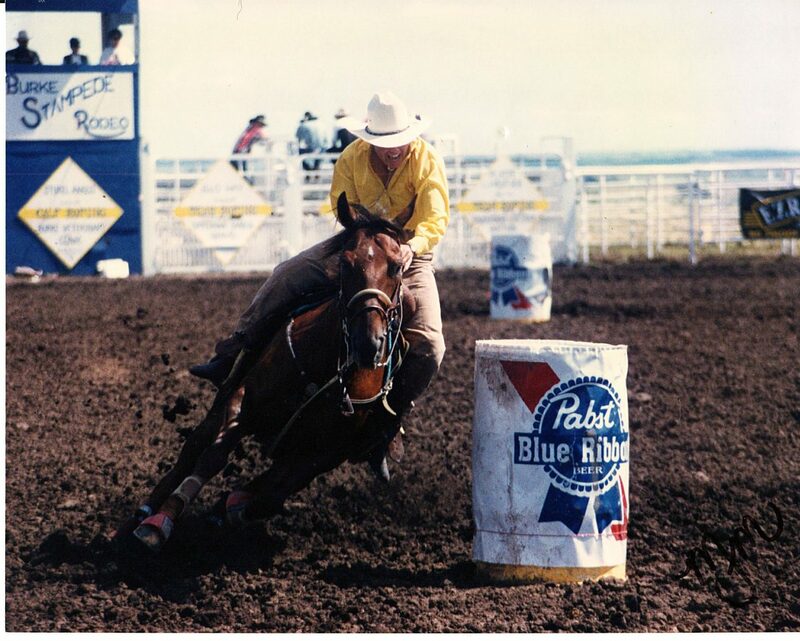 Cindy competed at twelve consecutive Badlands Circuit Finals Rodeos, and in 1990, she and John both won a Badlands Circuit title, qualifying them to go to the Dodge National Circuit Finals in Pocatello, Idaho. John’s win was in the team roping; he roped with Paul Tierney in Pocatello. In 2004, the Baltezores added a black stallion, Holy Bart, by leading barrel sire Dash Ta Fame out of High on Coaly. Cindy won the 2014 WPRA world championship futurity title with Famous Drift Go, whose sire is Holy Bart. Their bloodlines lead to trainability in their offspring. “All different kinds of people have done well on our horses,” Cindy said. Their main focus has been rodeo horses, though. Although John loved the tie-down roping, several shoulder replacements and knee surgeries don’t allow him to anymore. Cindy continues to run barrels; she was on her way towards another Badlands Circuit Finals qualification last year till her horse got injured. She does more futurities now, than barrel races, because of less travel with the futurities. The Baltezores have raised not only good horses, but good kids, too. Cindy and John are proud of their daughters. They’re hard workers, and have great people skills. “They will look you in the eye, and shake your hand, and tell you they’re glad to meet you, and mean it,” Cindy said.